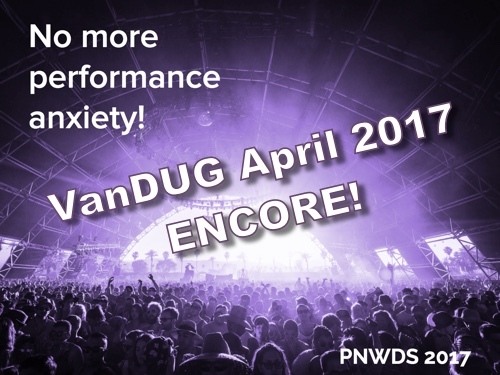 At our April 2017 meeting Renée Stephen gave the Vancouver Drupal User Group (VanDUG) an encore of her Pacific Northwest Drupal Summit (PNWDS) presentation: No more performance anxiety! The presentation walked us through the formal process of server load testing. Renée's current gig as Technical Consultant at Acquia gives has given her lots of experience on the subject and she knows how to present. It's always a pleasure when someone deeply steeped in domain knowledge gives a great presentation. You'll want at least 2 days, possibly more, to familiarize yourself with jMeter. I was also reminded of how much server and tool knowledge is required if you're the one doing the remediation. No single detail is exceedingly complicated but each technology in the stack has its particulars, tools, and metics. A big thank you to Renée for presenting. I missed the presentation at PNWDS and was happy for the second change to see it.